#Clinicians securing critical tubes need to be confident in the tape they choose. 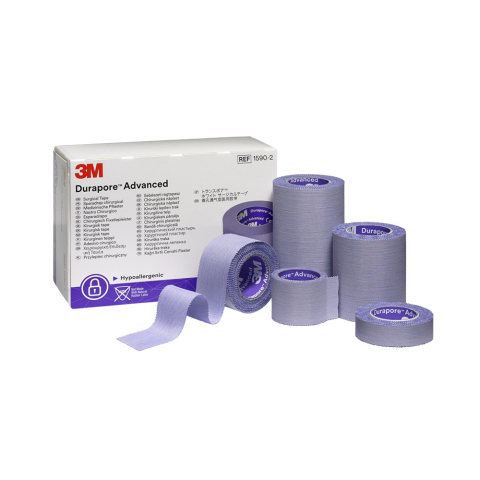 New 3M™ Durapore™ Advanced Surgical Tape provides exceptional adhesion to meet clinicians’ securement needs. ST. PAUL, Minn.--(BUSINESS WIRE)--One of the most important, yet stressful jobs clinicians do is to ensure critical, life-sustaining tubes are safely secured because even the slightest millimeter of movement can be life-threatening for some patients. While recent adhesive advances have incrementally improved critical tube securement performance, clinicians are still facing challenges to safe securement under hard-to-adhere-to conditions like diaphoretic skin, saliva and humidity. To fill this clinician need, 3M developed 3MTM DuraporeTM Advanced Surgical Tape, a high-adhesion medical tape designed to provide safe, reliable critical tube securement in challenging conditions like high-moisture environments. Unplanned extubations or dislodgement can significantly impact clinical outcomes, patient care quality and cost targets1, so it’s incredibly important that clinicians are confident that the tape they choose will perform. As part of 3M’s ongoing mission to redefine securement performance, adhesive scientists met with numerous clinicians to learn more about the real-world obstacles they encounter securing critical tubes. The scientists replicated the conditions that most frequently led to securement failure – such as humid, moist environments and various surface textures – and put the tape through 3M’s most rigorous medical adhesive research, development and testing process to date to make sure vast performance improvements were achieved in high-adhesion to skin, tubing and the tape itself. Laboratory testing showed Durapore Advanced Tape outperformed competitive tapes* in three key securement areas: adhesion to tubing, adhesion to skin after moisture occurs and edge lift. In a study of pull force needed to dislodge a tube from diaphoretic/moist skin, Durapore Advanced Tape required 44 percent more force on average than other tapes2. Exceptional Adhesion Performance: Durapore Advanced Tape maintains adhesion on oily or diaphoretic skin. The tape is also unique in that it is not made with natural rubber latex, yet provides better adhesion characteristics than latex-containing tapes2. Minimal Edge Lift: Tape edge lift can lead to adhesion failure, increasing the risk of extubation or dislodgement. In several studies, Durapore Advanced Tape demonstrated minimal edge lift or adhesive weakening after 72 hours of wear2,3. Adhesion to Skin, Tubes, Devices and Itself: Successful critical tube securement requires adhesives that can stick to multiple surface textures. While some medical tapes can fail in one or more of these categories, Durapore Advanced Tape adheres in all of them. For more information about Durapore Advanced Tape, including results of additional clinical evaluations against competitor tapes, please visit 3M.com/DuraporeAdvanced. Here you can also find educational resources on effective critical tube securement and request a product sample. 1 Shu-Hui, Y., Li-Na, L., Tien-Hui, H., Ming-Chu, C., & Li-Wei, L. (2004). Implications of nursing care in the occurrence and consequences of unplanned extubation in adult intensive care units. International Journal of Nursing Studies, 41, 255-262. 2 3M data on file. EM-05-014441. 3 3M data on file. EM-05-014427. *Durapore Advanced Tape outperformed Johnson & Johnson ELASTIKON® Elastic Tape, Hy-Tape® and Kendall™ Standard Porous Tape in adhesion to tubing/skin after moisture occurs and edge lift studies.